Among the many lessons learned over my decades-long career in urban conservation is that iconography matters. Icons have proven to be powerful catalysts in the conservation arena, particularly in the urban context. 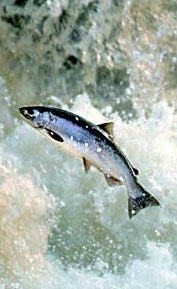 Salmon, for example, are the quintessential representative of the natural world throughout the Pacific Northwest in both urban and rural areas. Salmon are especially central to the life ways of indigenous peoples; constitute the basis for much of the region’s cuisine; and are a keystone species for watersheds ranging from the vast Columbia River to the smallest urban waterway in cities like Seattle and Portland. 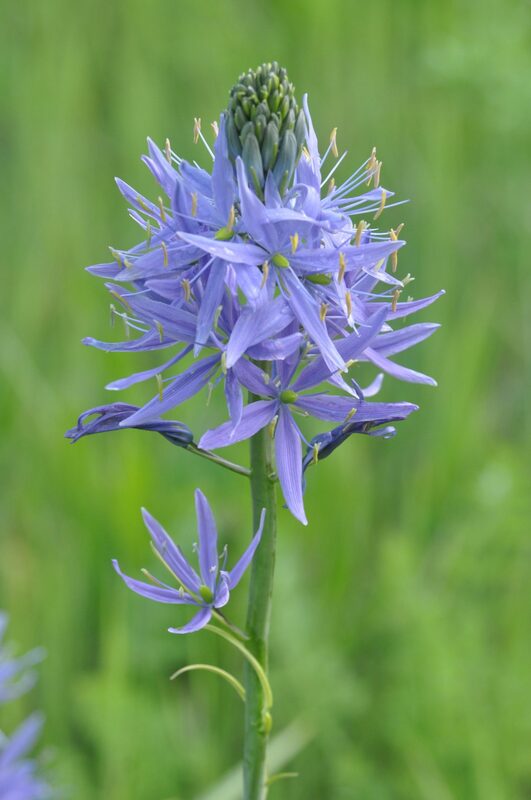 Camas (Camassia quamash) and Oregon white oak are both indicators of the now imperiled oak savannah habitat that once dominated the pre-settlement Willamette Valley in Oregon, a habitat maintained by active management of native tribes. 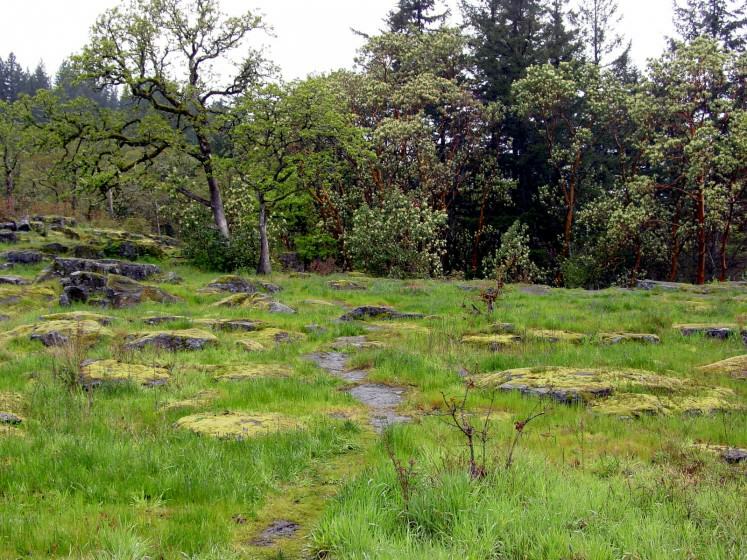 Both the salmon and oak savannah are the focus of much of the ecosystem restoration efforts throughout the Pacific Northwest for reasons that go beyond their formal status as threatened or endangered, owing to their cultural significance. 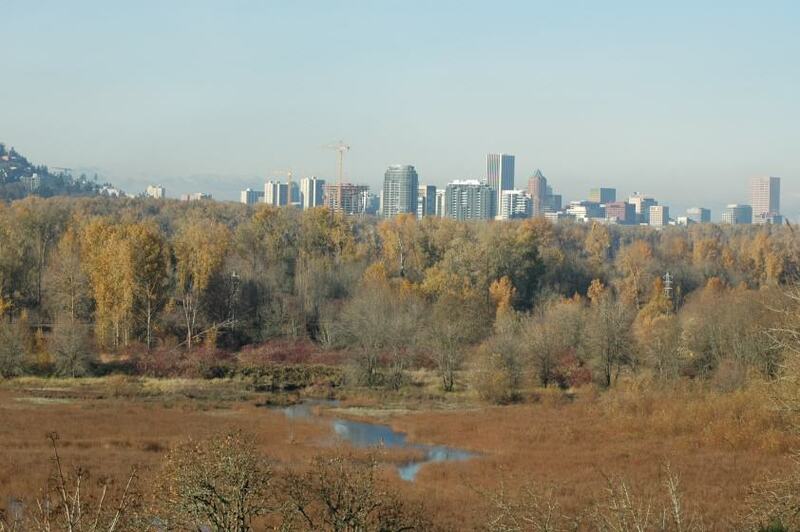 When I assumed the title of Urban Naturalist in Portland in the early 1980s, taking a cue from the attention given salmon and oak savannah, I wondered if we might establish an icon from the natural world to rally urban nature conservation in the Portland metropolitan region. 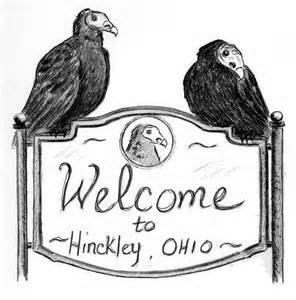 I had read that around sunrise on March 15th of every year since 1957 Hinckley, Ohio celebrated the concurrent return of spring and the Turkey Vulture to the “Buzzards’ Roost” at the Hinckley Reservation, part of the Cleveland’s Metroparks system. That tradition, initiated by Hinckley’s “official buzzard spotter”, Dr. Bob Hinkle who was a naturalist ranger for the park district, was even taken up by the Cleveland rock station—WMMS refers to itself as “The Buzzard”—and more recently by the local Chamber of Commerce, which hosts an official Facebook page complete with Buzzard Day Countdown. Berkeley, California also has a city bird, the Barn Owl, which instigator Lisa Owens Viani says was inspired by Portland’s heron. Her passion for Barn Owls began soon after moving to Berkeley in 2003. As she and a friend strolled around their neighborhood they heard a hissing noise that sounded like, what she describes as a respirator. On closer inspection the sound emanated from a palm tree. Unfortunately, not everyone in the neighborhood shared Lisa’s passion for the owl and the palm was shortly thereafter felled. Her concern for Barn Owl habitat and the fact that the owls predate on unwanted mammals led her to led her to the The Hungry Owl Project in Marin County and Raptors Are The Solution. She was surprised to learn that a dozen pair of owls nested in Berkeley, most in the Canary Island palm trees, such as the one in which she saw her first Berkeley owl. In what she describes as “the least controversial Berkeley Council resolution ever”, the Barn Owl was designated at the city’s official city bird. For more information check out Keep Barn Owls in Berkeley. As with Berkeley’s Barn Owls, the plight of a Great Blue Heron nesting colony that lay in the path of a proposed roadway realignment sparked a pitched battle against a roadway that would have been routed through several acres of wetlands and within a short distance of a public golf course. I got to wondering if elevating the heron’s status in Portland might draw attention to loss of habitat generally and at the golf course specifically. We had already engaged in a heron related land use issue in the late 1970s involving a sand and gravel operation at Ross Island on the Willamette River in downtown Portland. It seemed to me that herons were likely to remain in the cross-hairs of proposed developments for years to come and perhaps the time had come to enlist the bird in a public relations campaign. The Great Blue Heron, it seemed to me, was the perfect icon, being one of our most charismatic megafauna. They’re impossible to miss, standing over three feet tall, with a wingspan over six feet. No animal, save the salmon, is so representative of Portland’s urban nature scene. Its image is everywhere: blue heron cheese, blue heron condominiums, blue heron bowling lanes, even blue heron music festivals. They live year-round in the Pacific Northwest and can be found virtually anywhere there is water, from the smallest tributary to the Willamette and Columbia Rivers. Portland’s former mayor, Bud Clark noted for many eccentricities, including being a political novice tavern owner having deposed one of Portland’s most right-wing politicians, wearing Lederhosen and yelling “whoop, whoop” on late night TV, and his daily commute city hall in his suit and on his tricked-out bike. But, he was and still is an advocate for nature in the city. In the spring of 1986 Clark was asked to give the welcoming address at the downtown Hilton ballroom to a conference of Western fish and wildlife managers. 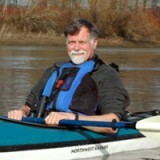 Bud was also an avid canoeist and duck hunter. During his presentation he gave impassioned descriptions of observing great blue herons from his canoe and as they glided by downtown skyscrapers. Voila, I thought! 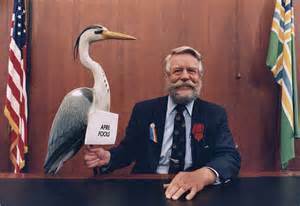 Given Bud’s impulsive nature, love of nature, and mayoral authority, I grabbed him by the arm as he exited the Hilton and suggested he declare the heron Portland’s official city bird. 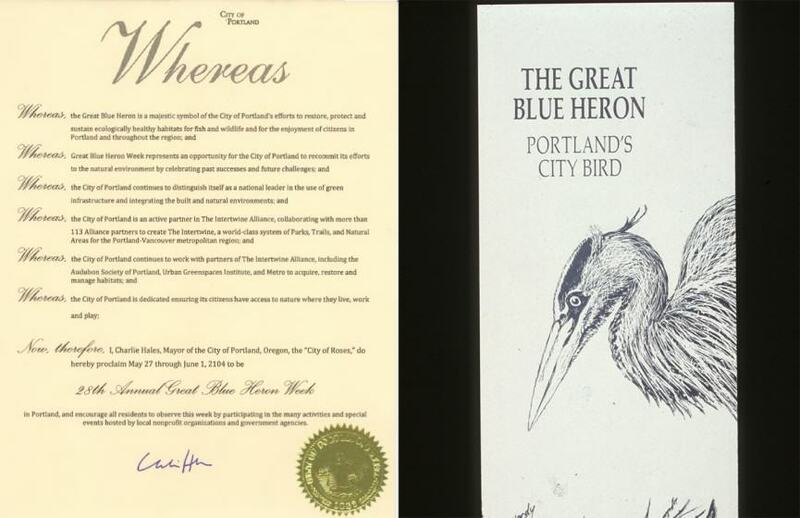 A few “Whoop, whoops” and two weeks later he issued a proclamation before City Council declaring the Great Blue Heron Portland’s official bird. The golf course, by the way, was renamed from West Delta Golf Course to Heron lakes Golf Course. Ironically, the eighteen holes adjacent to the heronry was named Greenback after what was then called the Green-backed Heron and the second 18 holes were Great Blue. 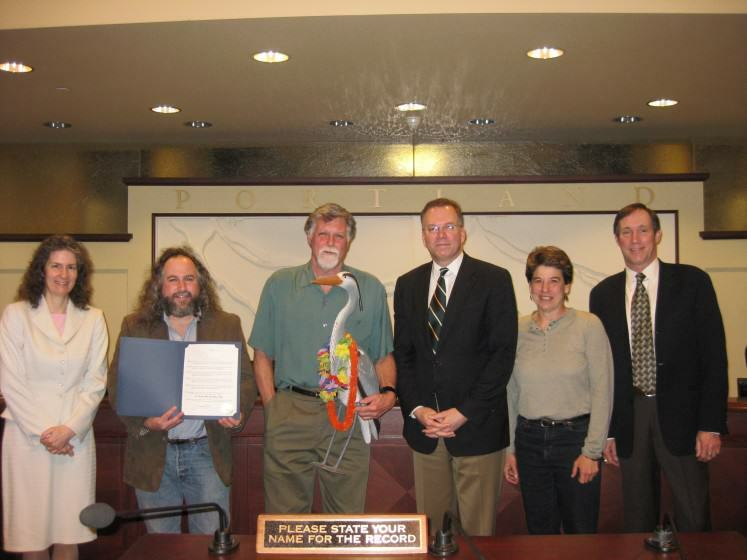 While adopting an official city bird may sound frivolous, the process of establishing an official city bird when combined with an annual celebration and mayoral proclamation provides a great opportunity to encourage local elected officials to “re-up” their commitment to ensuring that symbol of the city’s environmental quality. In Portland we have celebrated Great Blue Heron Week the last week of May and first week of June every year since 1986. 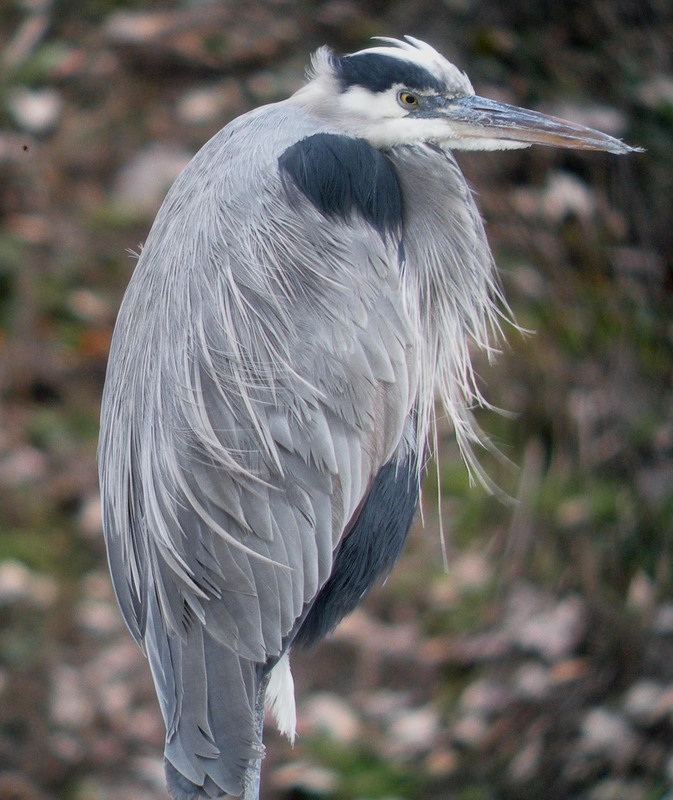 Portland’s mayor reads, and the city council adopts, a new proclamation with numerous clauses establishing why Portland cares that herons live in our midst. The annual proclamation ends with city commitments to undertake habitat acquisition, restoration, and management during the coming year to protect and improve heron habitat and, by extension, fish and wildlife habitat generally throughout the city. And, then of course, depending how creative and expansive you want to get, there are always leveraging opportunities. Having just returned from city hall after the first proclamation to one of our favorite watering holes, Bridgeport Brewpub, the brew master walked by and asked how our urban conservation efforts were going. I recounted the fact that we’d just adopted a city bird and he responded he’d just brewed a new ale which he had not yet named. 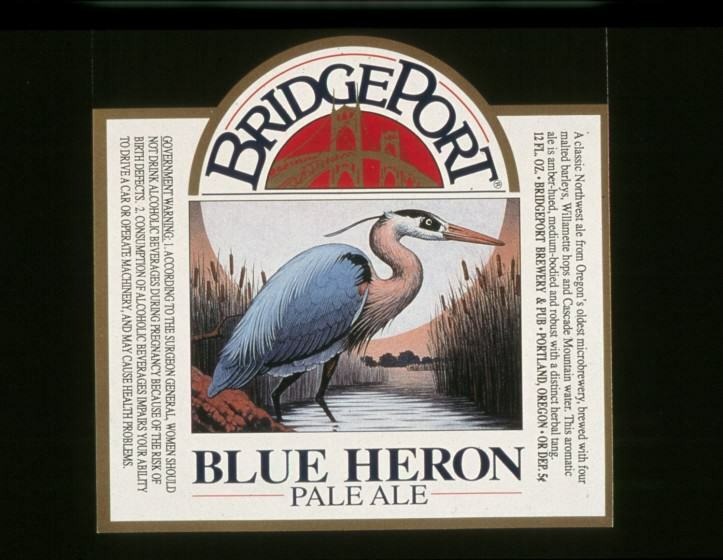 Blue Heron Ale was launched that afternoon. 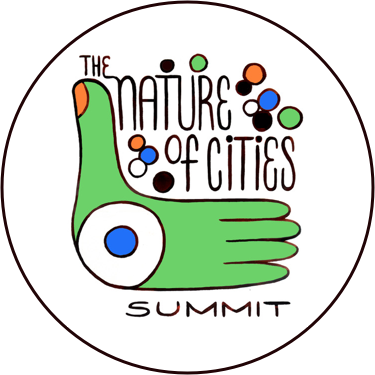 Again, what may sound frivolous to some turned out to be a significant “oiling the gears” of urban conservation. Bridgeport became the gathering place for elected officials, agency naturalists, and park advocates where relationships were spawned and plans were hatched for increasing the region’s system of parks, trails, and natural areas and creating healthier watersheds and urban ecosystems. 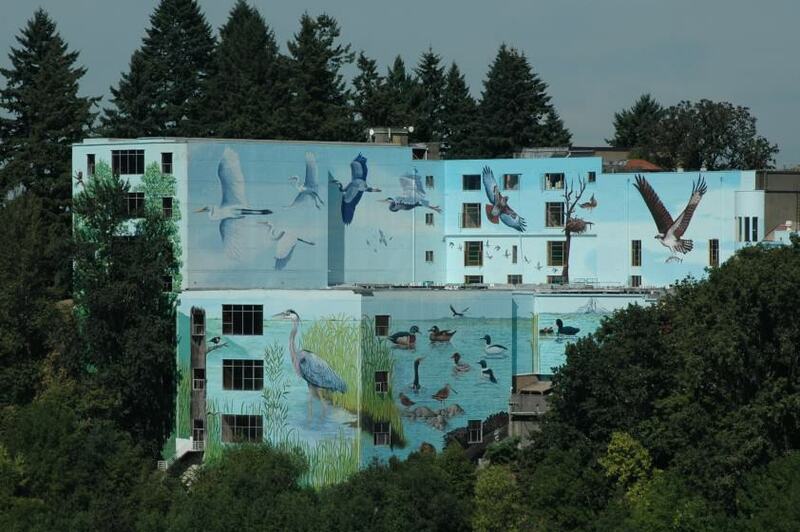 Five years after the heron became our city bird I approached a muralist who agreed to create a seventy-foot high, fifty-foot wide heron mural on a mausoleum overlooking one of the city’s most beloved wetlands, 160-acre Oaks Bottom Wildlife Refuge. Twenty years later we collaborated to expand the original mural with a 55,000 square foot wetland motif to draw the public’s attention to the Bottoms, hoping to accelerate public support for its care and restoration. Portland Memorial Mausoleum and mural. Berkeley’s Joe Eaton, in Keep Barn Owls in Berkeley, reports other examples of city’s having adopted official city birds, including San Francisco (California Quail; Seattle (also the Great Blue Heron);Chicago (Peregrine Falcon); and Port Aransas, Texas (Roseate Spoonbill). Internationally Eaton reports the following cities and their official bird: Seoul, South Korea (Magpie); Xiamen, China (Egret); Keelung, Taiwan (Eagle); and in Japan Hamamatsu’s Swallow; Morioka’s Wagtail, and Chiba’s Little Tern. There apparently quite a few other Japanese cities with city birds as well. 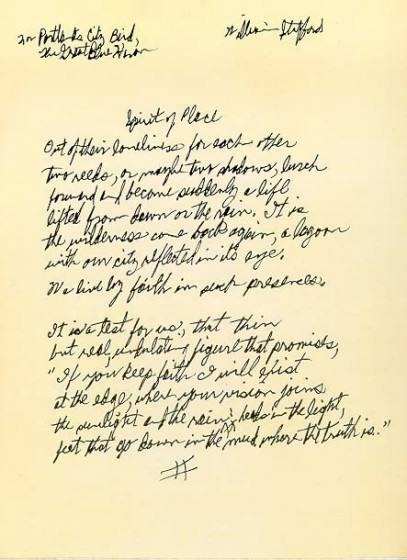 As we prepare for this May’s Great Blue Heron Week and our annual trek to Portland City Council, I have been re-reading William Stafford’s Spirit of Place poem, which I asked him to write for the first heron week while he was still Oregon’s poet laureate, twenty-nine years ago. 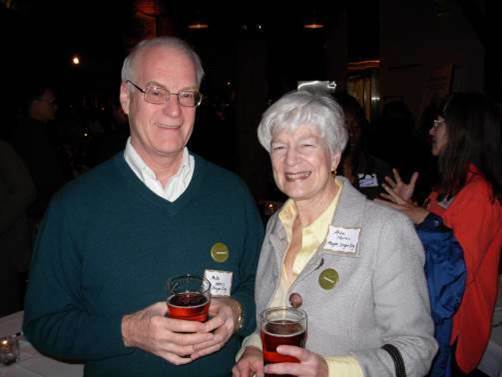 With all of the toasting of Blue Heron Ale, countless city proclamations, and other events, nothing comes close to capturing the intent of creating an iconic representative of the natural world that informs our efforts to create a livable, lovable, and ecologically sustainable city as Stafford’s, Spirit of Place. What a wonderful annual recognition of the relationship between a people and a beloved symbol whose presence reminds us all of the beautiful things we share. The Heron seems to be everything our state bird is not, a bird that is regularly seen and loved by those who care to take notice, a bird with a genuine affinity to its locale not 5 other grassland states. At the big annual Meadowlark festival or on the bumpers of most cars when Oregonians travel they can always spot each other in their Meadowlark gear, oops wrong bird! And official recognition, Bud Clark’s proclamation was to and with the city counsel, Portland’s example of a well leveraged symbol is something our state might be well advised to take notice of. The pompous Governor Patterson did our state a true disservice in ’27 when he unilaterally “proclaimed” our state bird without putting the matter to the legislature. Unlike jory soil or microbes there is no statute for a state bird on the books, our defacto state bird was chosen from a list of only 5 passer-forms and is a footnote novelty in the state Blue-book. If everybody truly loves Sturnella neglecta, if there is a real Oregon affinity to the Meadowlark why has no-one bothered to make it an official symbol of Oregon? If it were only up to me I would #parkthelark. What say you? Lisa, my apologies for inserting GG Audubon where Raptors Are The Solution. Should have checked with you on that, but deadline loomed! One thing you did not mention in your How Did The Barn Owl Become Berkeley’s City Bird is what date that occurred. That citation also got lost in the transfer from me to David Maddox. 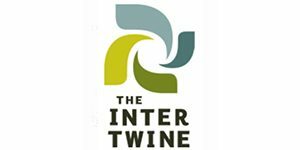 Would you kindly supply others with the link to your interesting piece and, of course, any additional details I did not capture? In fact, a bit more on the “respirator” would be fun to share. You were with Ann Riley as I recall, no? At any rate, great to see you were the first one to comment. Give my regards to Riley. She and you should provide an essay on urban stream restoration in the Bay Area to David Maddox. I will suggest that to him as well. Keep Barn Owls in Berkeley actually led to the formation of my current organization, Raptors Are The Solution (www.raptorsarethesolution.org), as I became aware of the great risk to these owls and other raptors, from the widespread use of rat poison–even in Berkeley. The City of Oakland has a similar opportunity right now–to appoint a city bird–which it is sadly not taking advantage of. 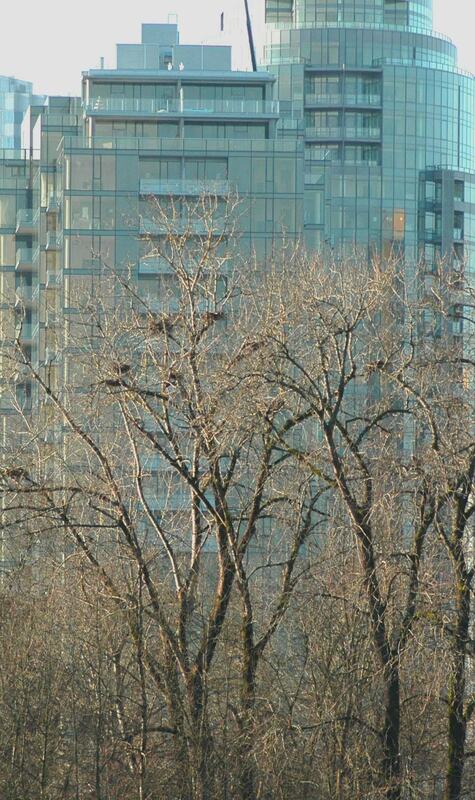 They have a downtown nesting rookery of Black Crowned Night Herons, pretty unique in such a densely populated area. However, the city is not doing anything to protect or promote these birds, despite the efforts of several nonprofits to create safer conditions for them.